Stars are a time-honored way of flagging and highlighting emails, but you can supercharge their functionality in Gmail by adding up to 11 alternatives on top of the original. 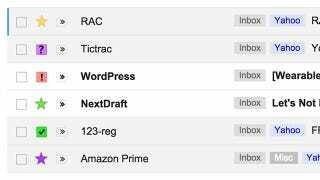 From searches to quick links, these extra stars can give you more control over your inbox and how it's organized. Here's how to get them added and use them with your messages. Click the cog icon to the top-right of your inbox on Gmail on the web then choose Settings to delve into the 11 pages of options that are available. The extra stars can be added about halfway down the General page of settings—drag any of the icons from Not in use to In use to activate them, or choose from one of the presets. You can also drag the stars you've got into a different order. This is the order Gmail will cycle through as you click on the star icon next to a particular message, so make sure the ones you're going to be making most use of are near the front of the list. You can return back to make changes whenever you like. If you disable a particular star, any messages labelled with it revert back to using the standard yellow star instead. To pick up all the emails with a question mark next to them, for example, enter has:purple-question in the search box. Note too that adding any star to a message moves it to the Primary tab if you're using the default tabbed view for Gmail. If you've been using yellow stars to keep track of emails to follow up, funny messages, things to do and important emails that you don't want to forget, this is one way of distinguishing between those categories. Activate the Quick Links feature from the Labs tab in Settings and you can set up permanent links to each of the stars that are only a click away from the front page.